*Current Authorisation Hold - currently unavailable for use (in development). Authorization Hold - process used for verifying electronic transactions initiated with a debit or credit card, a current authorisation hold amount is therefore the amount awaiting authorisation, being as such unavailable for further withdrawals until either the merchant clears the transaction, i.e. settles it, or the hold expires. You can only edit deposit accounts' terms and conditions when the account isn't active yet. After they're approved and in the Active state only the name, notes and custom fields can be changed. You can change an account's name or description at any time and regardless the account's state. To do this open the deposit account > click on More Actions > Edit Description > make the changes > Save Changes. 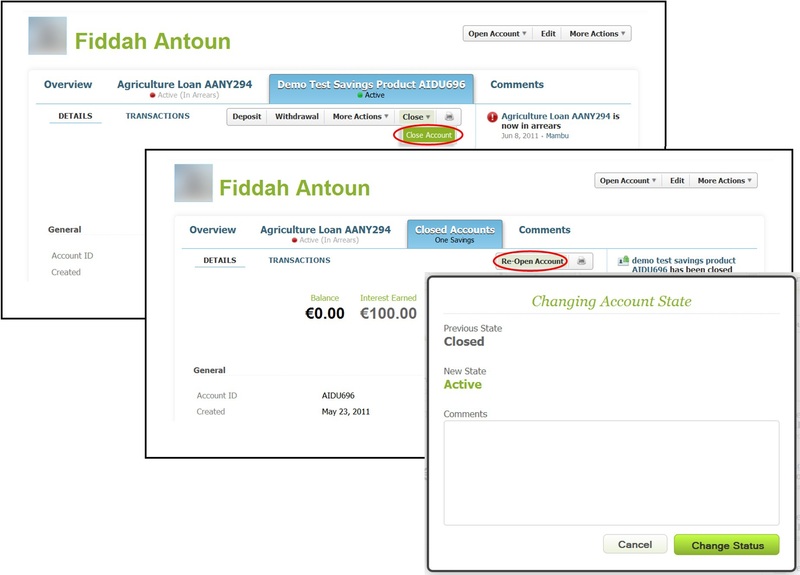 - To Rename the account, Open the loan account > Click on More Actions > Rename Account > Make the changes > Save Changes. You will only be able to close deposit accounts when the balance has been totally transferred out. To close an account open that account > click on Close > add comments if you want to have them associated to the closed account > click on Change Status. When a deposit account is still Pending Approval and the application hasn't fulfilled your organization's requirements, for instance, you can choose to reject it. To reject an application, open the account > click on Close > Reject Account > add a comment about the reason of rejection > click on Change Status. If the client or your organization wants to withdraw the request for a deposit account open the account > click on Close > Withdraw Account > add any notes about the reason for the withdrawal > click on Change Status. Any deposit account in the state Active or Active in Arrears can be locked. Locked accounts will not allow for any transactions and won't charge or collect interest for the time they remain locked. To lock an account, click on More Actions > Lock Deposit Account > Change State. To unlock an account, just click on More Actions > Unlock Deposit Account > Change State. When and account is unlocked, it goes back to the state it was before being locked. So if it's an overdraft account, for instance, and it was in arrears, when it's unlocked it's state will still be Active in Arrears. If a deposit account is closed by mistake or if a client who has been inactive for some time comes back to your organization and wants to use the same account, you can re-open it. This is possible for Savings and Current accounts only. To re-open a deposit account open the client's profile > click on the Closed Accounts > Re-Open Account > enter a comment about the reasons > click on Change Status. Only deposit accounts of the type Regular Savings can be re-opened. Maturity Period is the time during which no withdrawals can be made in a Savings Plan or Fixed deposit account. The duration of the period can be defined in the product's settings and is then manually activated under each account after a first deposit has been made. Only administrators and users with the Make early withdrawal permission can make withrawals during a maturity period. To activate the Maturity Period click on Begin Maturity Period > enter the maturity date > Change Status. The maturity date determines the end of the Maturity Period, so after this date the accounts won't continue accruing interest and the clients will be able to withdraw their money with the accrued interest. 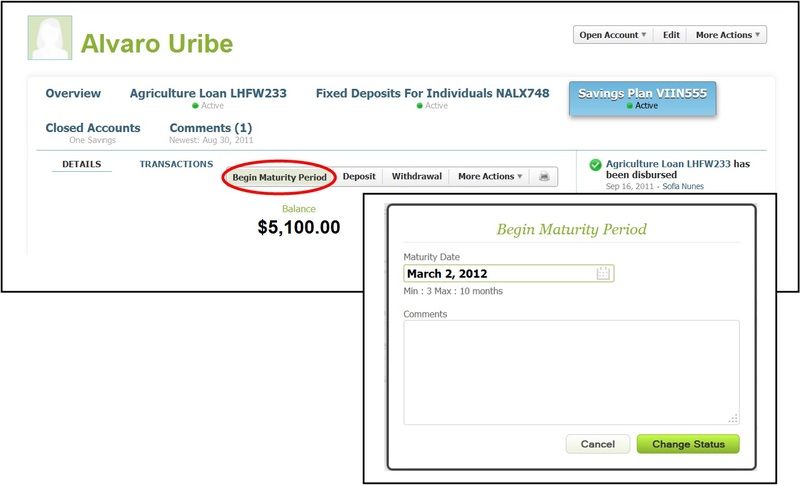 Only users with the permission to "Activate Maturity" can begin the maturity period in an account. You can undo this action under More Actions > Undo Maturity Period. In Mambu you can adjust overdraft terms on an active deposit account. To do so go to More -> Adjust Overdraft Terms. When the overdraft limit is changed, a non financial transaction, "Ovedraft Limit Changed", will be logged, which helps in calculating the number of days in arrears for the account. When the limit is set below the negative balance, the difference between Overdraft Limit and Balance will set the account "In Arrears". When the Overdraft is in arrears, you will see "Overdraft In Arrears" on account overview, under "Overdraft Conditions" section.